I really wish we had some video of this report, but till then, we have to take the eyewitness testimony of it. 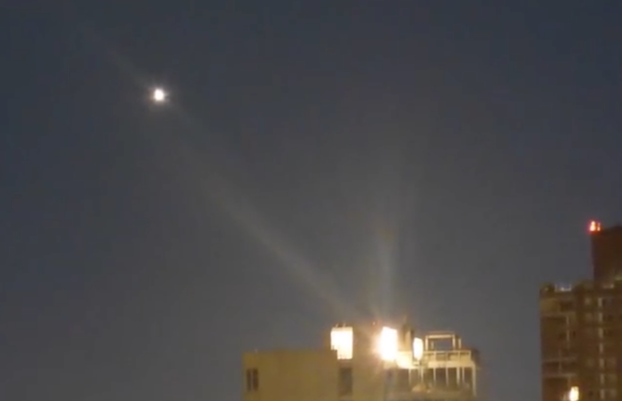 I would like to see this UFO as it shot away from the building to see how fast it moved and the flashing of the lights around it. Video is the key here to 100% confirmation of it being aliens or not. But this is still a great photo of a glowing object flying into a beam of light coming from the building. It reminds me of the old John Lennon UFO report that he and his wife saw from their New York balcony long ago. I wonder…does a history changing person live in one of these top apartments of this building? A person of significance who changes the world in some way? I bet if they are there, its because they are looking for a specific influential person…to read their thoughts, to see the person in person, or to program them to do more. Next Post:102 Year-Old Woman Speaks About Her UFO – Flying Saucer Sightings in Australia, UFO Sighting News.